Here's How Cold and Wet It'll Be This Winter Across the U.S.
Look, it's hard to start thinking about winter now, when you have a fridge full of pumpkin beer and still need to make time to get out and see the changing leaves. But after last winter's frigid bomb cyclone and record snow storms, it would behoove you to get a sense of how much cold and snow to expect this winter. 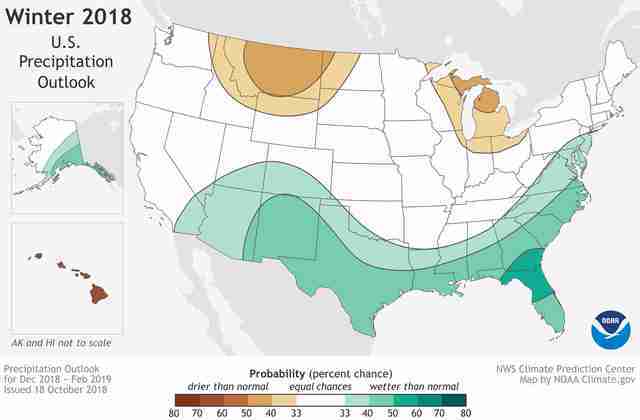 Thankfully, the 2018-2019 season might not be too bad in many parts of the country, according to a new winter weather outlook issued by National Oceanic & Atmospheric Administration (NOAA) on Thursday. 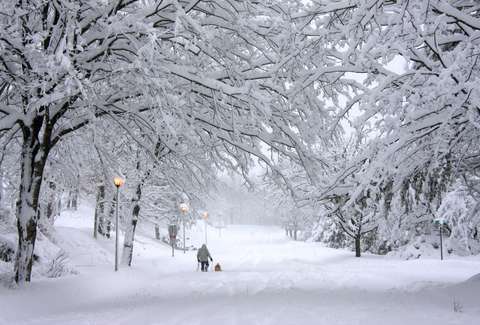 In its latest Winter Outlook report, NOAA’s Climate Prediction Center said forecasters currently predict a mild winter for much of the United States, so you may not have to disappear into a cocoon of blankets and pizza boxes after all. Specifically, there's a good likelihood that warmer temperatures will occur across two thirds of the country (including Alaska and Hawaii), and thanks to a weak El Nino system that's expected develop early in the season, signs are pointing to drier-than-average conditions in northern parts of the country and wetter-than-average conditions in the South. Oh, and there's not a single part of the country favored to have lower-than-average temperatures. To be clear, the outlook doesn't include snow accumulation forecasts, but rather precipitation in general. Even if the season is expected to be warmer and drier than normal, there's still a chance that a blizzard will inundate your neighborhood with snow, so uh, that leftover pumpkin beer that ends up in the back of your fridge might just come in handy. As you can see on the NOAA precipitation outlook (shown above), some parts of the country are favored to have a wetter winter than others; namely, the South. Parts of southern Georgia and northern Florida are expected to be the wettest, while the wetter-than-average conditions will likely span from New Jersey to southern reaches of California. Meanwhile, the northern Rockies, northern Plains, and northern Midwest will likely end up with less precipitation than average. Again, this isn't a snow forecast, but hopefully, this will translate into less snow you'll have to shovel this winter. You have to be as optimistic as you can before the short, dark days set in. In case you're wondering, the areas in white on the map are the places where there's an equal chance of lower-, normal- or higher-than-normal precipitation. Basically, the forecasts aren't leaning towards one over the others. 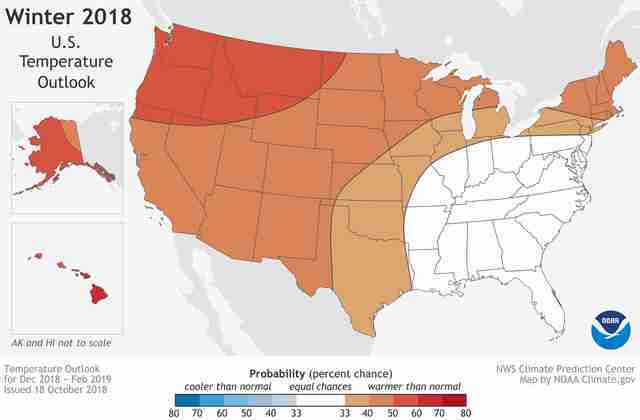 As for temperatures, it looks like most of the country will be blessed with above-average numbers this winter (including Alaska and Hawaii), according to the report. The greatest likelihood for higher temps is in a long stretch from Alaska through the northern Plains. However, a big chunk (shown in white) of the country -- the Southeast, Tennessee Valley, Ohio Valley, and Mid-Atlantic -- have equal chances of lower-, normal- or higher-than-normal temperatures. So, while the predictions aren't pointing to colder than normal conditions, it's not entirely out of the question for many regions. Remember that blanket and pizza box cocoon? You might end up needing it after all. All said, the outlook may point to a mild winter, but that doesn't mean you shouldn't drink up fall while it lasts. Tony Merevick is Senior News Editor at Thrillist and is definitely not ready winter -- that is, he still needs to get a new coat. Send news tips to news@thrillist.com and follow him on Twitter @tonymerevick.